A Ferrero Rocher Box of 300 gm containing 24 pieces. Designer jute paper and ribbon are recyclable. Usage of green filler depends upon seasonal availability. Glads or Gladiolus is the birth flower of August month. In England, the roots of the flower were used to remove splinters. 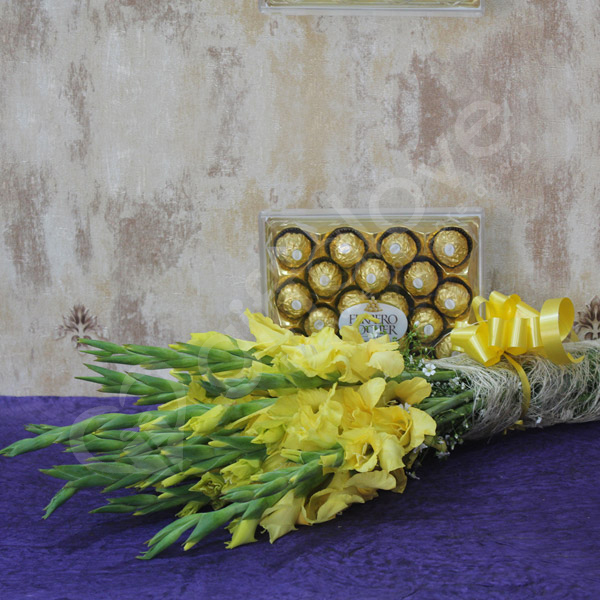 Win your dear one"s heart on this special movement of the year with this wonderful yellow flower bunch and delicious chocolate combo which will delight your loved ones in a great way. It"s the perfect thing to make choice for and surprise someone very dear and near. 5 Great product with speedy delivery.